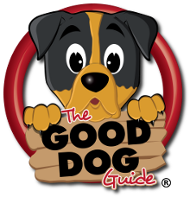 The Good Dog Guide specialises in promoting only dog friendly businesses & services to UK dog owners. With a range of listing options, banner advertising & social media packages we can help any dog friendly businesses with affordable advertising. Getting your business promoted online could not be easier. With 3 listing packages to choose from there's an option to suit every advertisers budget, from a free listing to our top premium package which costs just £40.00 per year. 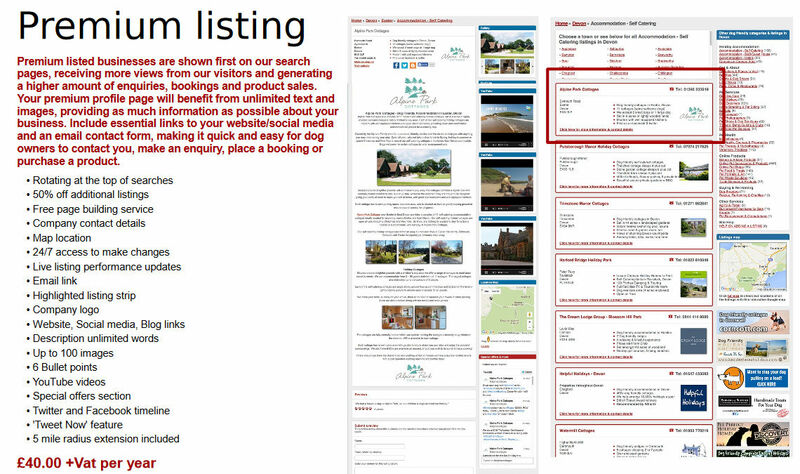 Every listing benefits from it's own profile page which can include essential links to your website, email & social media, your logo, unlimited text, images & videos all about the services & products you offer, along with your full contact details making it quick & easy for dog owners to make an enquiry, place a booking or purchase a product. We believe in total transparency, every advertiser benefits from their own login account. Providing you with a live view counter to keep a check on how many dog owners are viewing your business daily. Take advantage of our free design service, using information from your website or details you provide, we will design your premium listing profile page for you & even update it regularly when required. Our banner advertising can promote your business across the whole of the UK or just within the specific Counties you cover. Banners promote your brand awareness, services & products, linking straight to your own website, driving more online traffic directly to your business. We have thousands of dog owners engaging with us daily on social media. You will have access to tweet your business daily to our Twitter followers or we can do it for you using our special Twitter package. For more details about our services and examples of listing options and banner advertising please view or download our media pack. Premiums are always listed first, followed by Basic & finally free listings. All listings rotate at the top of their chosen option. First Premium listing is charged at full price any other Premiums you require in different categories or Counties are discounted by 50%. Free page design service on all premium listings using details from your website or information provided. Up to 2 telephone numbers & your full address or just your town & County. Google map pinpointing the exact location of your business. Full access to your listing to make changes or we will make them for you, for no extra charge. Counter located in your account to see exactly how many dog owners are viewing your business listing. Using our pop up messaging service dog owners can contact you direct via email, while your email address is hidden to help combat spam. Your Company logo or image shown on your listing strip & profile page. Premium listings benefit from a prominent bold border & include your logo or image, address & bullet points highlighting your services or products. Direct links to your website, Twitter, Facebook including your like counter & blog. 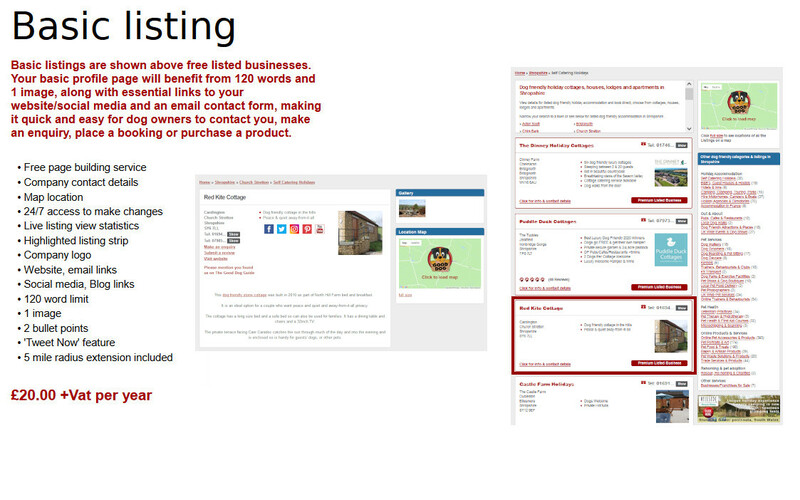 Including text, hyperlinks & images about your business, by manual input or using copy & paste. Unsure what to add? Just ask & we will do it for you. Shown within a gallery promoting your business, products & services. Shown on your listing strip & profile page, highlighting your services & products. Up to 3 videos, either your own or taken from YouTube. Shown on your profile page to promote your special offers or extra information. Your live Twitter & Facebook feed shown on your Good Dog Guide profile page. Tweet & promote your business daily to our Twitter followers, using a tweet set up for you in your account. You do not need your own Twitter account to use this. Listings are shown within a 5 mile radius, if you cover a larger area we can extend your radius for a charge of £1 per mile. This does not apply to UK wide categories. VERY IMPORTANT You can either list your own business by choosing one of the options above OR take advantage of our FREE DESIGN service by contacting us with your business details & chosen premium listing option. Internet bank transfer, PayPal or card details via telephone. All our advertising prices are subject to VAT. Banner advertising promotes company, brand & product awareness, linking straight to own website, driving more traffic & dog owners directly to your business. We can promote your business across the whole of the UK or just within the specific Counties. Shown UK wide across website on all County, town & category pages or just within specific Counties. 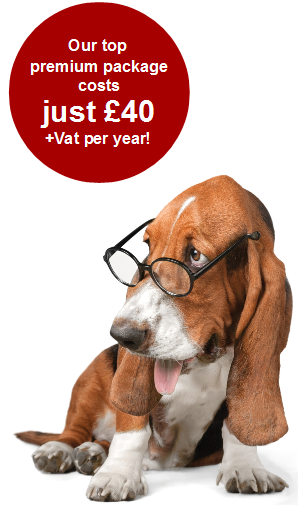 £100.00+vat per year or £40.00+vat per year for specific counties. Banner is shown on desktop & mobile version of website. We also offer a larger version of our landscape banner, perfect if you have a lot you want to promote within your banner & stand out even more from your competitors. Prime position, portrait sized banners placed on the left & right, shown on every page across our website, including all the individual profile pages for listed businesses. The banners float up & down as the pages are scrolled. Floating banners only show on the desktop version of our website. Landscape banners are shown on desktop & mobile versions. 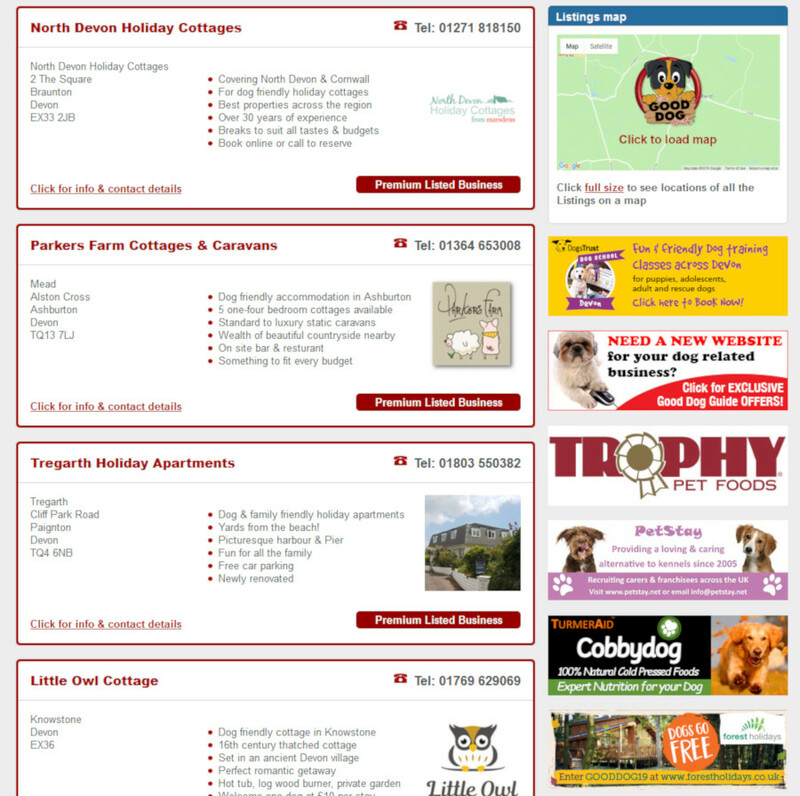 We offer a special advertising package that includes all forms of Good Dog Guide promotion. The banners we place on our website create millions of impressions each year for businesses. Please contact us if you would like performance statistics for any of our banner options. All our statistics are in built, which enables us to provide every advertiser with accurate banner performance including impressions & direct clicks generated to your website. All banners rotate taking it in equal turns to be shown. We have over 36,000 dog loving followers on Twitter & tweet every couple of minutes to keep our followers up to date with details of the dog friendly businesses we have listed on our website & exciting offers they are promoting. Our tweets alone generate over 1.5 million impressions every month. Promoting your business, services & product offers on Twitter could not be any easier. We will tweet for you, randomly throughout the week to our followers, with three different tweets supplied by yourself or written by our team. Each tweet will link directly to your website or if you prefer your Good Dog Guide profile page, include an image, all the relevant hashtags & @ you in (if you're a member of Twitter). You do not need your own Twitter account to use this service. We use a Bitly redirect link in your tweets, this enables us to provide you with the total amount of clicks the campaign generates to your website. £60.00+vat for 3 months of promotion. We welcome articles & inclusions for our Blog. If you'd like an article considered for inclusion please email it along with any links or images to: info@thegooddogguide.com. If your article is to advertise a business or product a £30.00 admin fee will be charged. Please feel free to post on our Facebook wall to have your say & promote your business to our dog loving followers. And if you would like us to retweet your business tweets just include @thegooddogguide in them! We will retweet any tweets we feel are of benefit to our followers. Thinking of advertising your business with us? Click here to read some of the testimonials we have received from other advertisers. Please contact us direct if you would like more information about advertising your business with The Good Dog Guide.